Let's put the information from our last adventure, the Field Guide To Dating Topps Wrappers, to the test today. 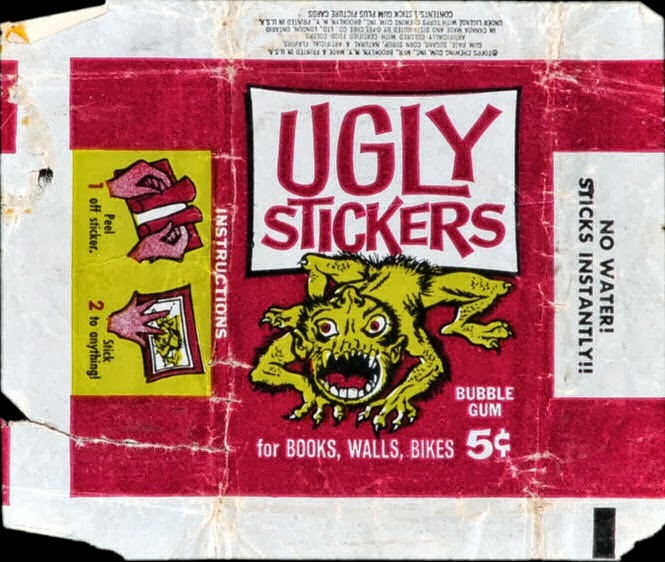 Imagine a string of eBay listings for a Topps Ugly Stickers wrapper. First issued in 1965, the set saw three reissues in 1973, 1974 and 1976. Both are described as 1965 wrappers but only one is of course. In terms of easily distinguishable features the first on has no manufacturer's logo on it and no production code displayed, although a five cent price is prominent. The second one has the "curved" Topps logo, a production code and no price. The five cent price on the first is a clue that it was manufactured before the middle of 1969. The lack of a logo makes it harder to cipher as without it you can't be sure of a pre-1966 issue unless you know the history of Ugly Stickers, which you assuredly would if bidding on the wrapper. 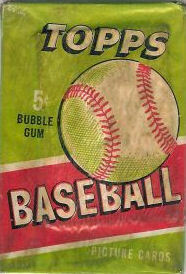 The lack of a production code would indicate a pack sold before 1966 or 1967 to boot. So the purple wrapper is easily confirmed as being from 1965 and this being a popular set, is the most valuable of the four. The green one is clearly from 1973 as the production code of 0-453-85-01-3 makes clear. Similar to the other two wrappers, this has more information in the side panels but you only need to spy the production code of 0-482-21-01-4 to know it's a '74. One of the things that drives me batty about eBay is the fact so many items are incorrectly described and dated. Sometimes this is intentional but often it is not and merely results from a lack of understanding on the part of the seller. Misdating happens with third party graders and in catalog auctions as well but it's especially prevalent on eBay and sometimes there is not enough in the descriptions or scans to figure out what you are looking at. 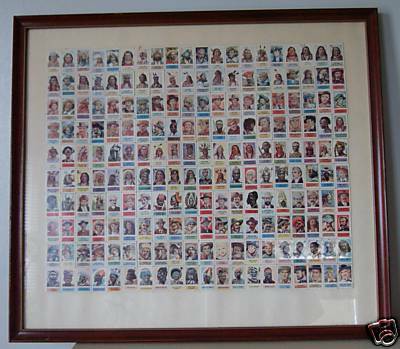 So I thought a little guide to various identifiers on many Topps wrappers might be helpful. 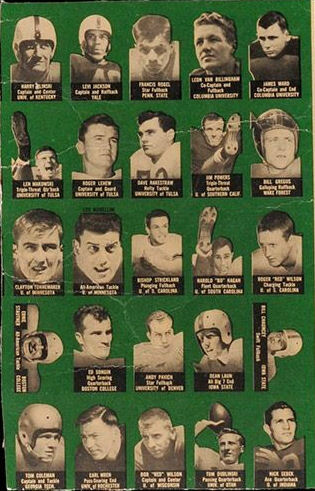 This post mostly covers wax wrappers post 1956 but some of the graphic elements discussed below can be found on Cello and Rak Paks in many instances. Given that there are not many wrappers from this era that can't be identified by date just from their look (and general hobby references) and the small amount of reissued sets, there's not much I can say that is helpful. I know that sounds like a copout but it's the truth! Still, there are some things worth knowing. Differences in the three earliest Tatoo issues (1948, 1949, 1953) can be seen in detail here. The 1948 and 1949 series of Magic Photo each have dated penny wrappers and the 1955 penny (small) Hocus Focus cards come in a similar wrapper but carry a 1955 date. Some more on that can be found here. 1949 and 1955 Funny Foldees could have different packaging but nobody knows which is which or even if there is a difference. There possibly was a Golden Coin reissue in 1952 (originally a 1948-49 release) that may be worth knowing about as the different Golden Coins between the two sets could exhibit some slight differences. The problem is no 1952 issue of the set has been confirmed, although it is highly likely it occurred. More information is here as to why. 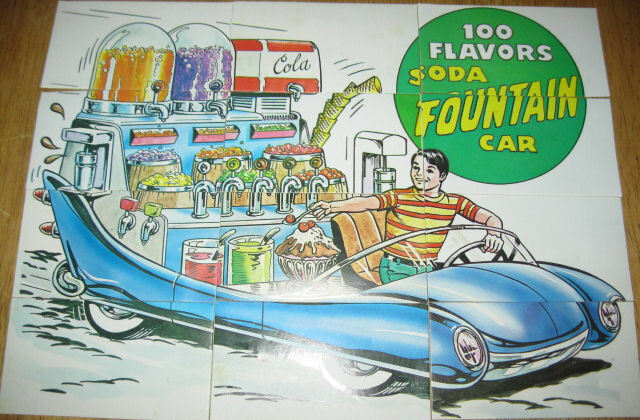 World on Wheels has wrappers that reference either 1954 or 1955, the latter containing the higher (and more valuable) numbers. Have a look here. 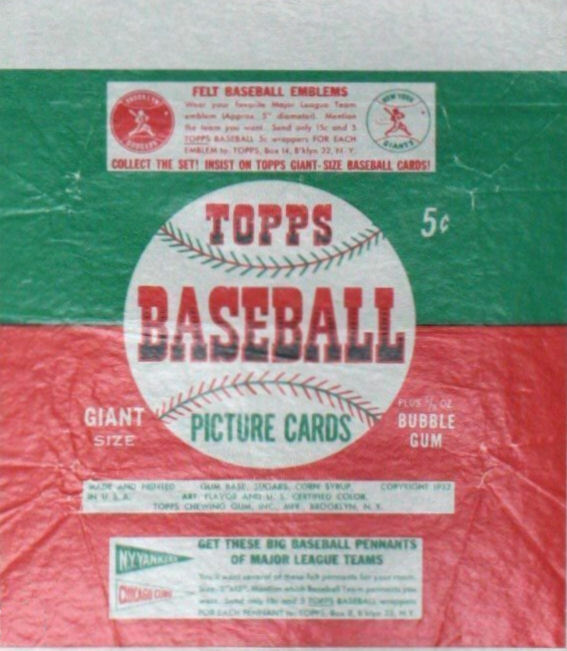 Topps went to a standard size of 2 1/2" x 3 1/2" for most of their releases starting with Elvis Presley in late 1956. 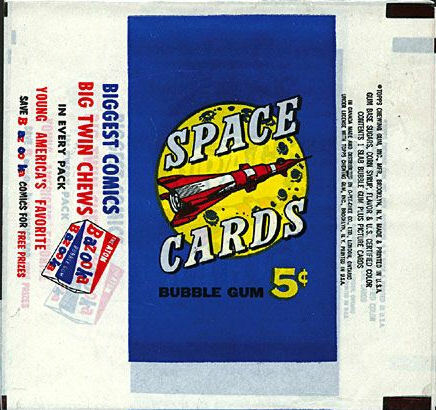 Dating some issues by the wrapper can be tough but for most it's not a problem as the year and cards are well known. Wrappers from 1957 to mid 1958 can be identified by two different methods. 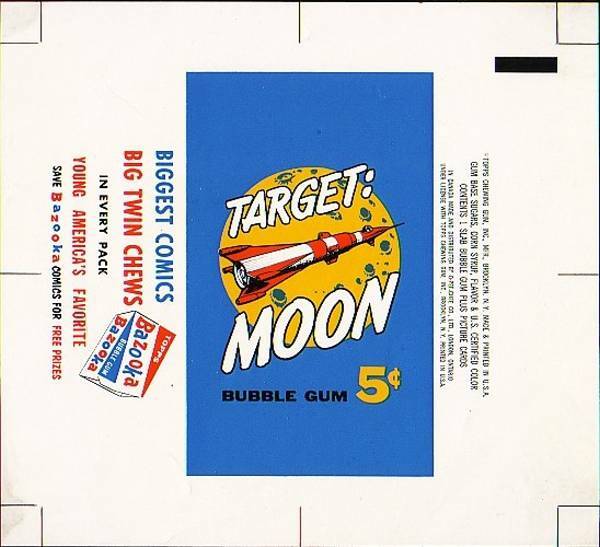 Blony would go dormant (or very, very quiet for a time) until being revived as a twist wrap product around 1968 but it was not the well-marketed product that Bazooka was. Bowman had also marketed Blony as a twist but in more of an elongated shape (Topps' had a rounder look to theirs). 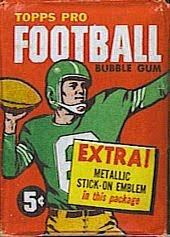 Yes, that's a Canadian All-American Football wrapper! Side panels will have the Topps (or Bubbles Inc.) address displayed in almost all instances and prior to mid-1963 ZIP codes were not used (they were introduced on July 1 of that year). Some address lines might display the old "Brooklyn 32" style (almost all do not but I haven't seen all of them) but if there is a premium offer you will see it in the relevant text. However, the use of "32" on some premium offers went well into 1965 so while a ZIP code is definitely post-1963, a two digit code is not always pre-1963! Still, as there are not too many reissues or anomalies prior to 1966, looking for the plain Topps logos will usually be enough to see what's what. 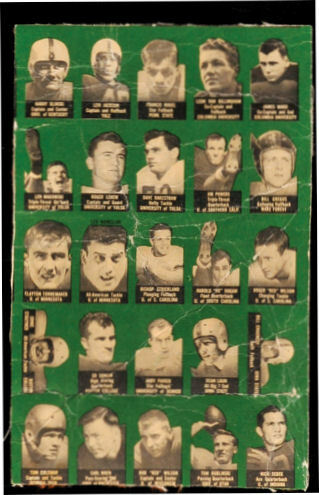 Penny packs of 1965 Baseball were produced but by the time Football came out, the practice had ended, so you can't have a one cent pack any later than 1965, except for penny tattoo issues, which were much smaller in size at this time anyway than the standard sized issues.. 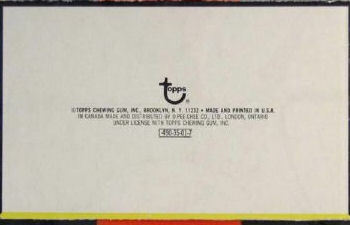 In 1966, roughly coincident with their move of confectionery production, packaging and warehousing facilities from Brooklyn to Duryea, Pennsylvania, Topps created a new, lower case curved "Topps" logo that was the most well known version. 1966 Baseball, the first card/gum set produced in Duryea had this new logo, although the Topps manufacturing address on the packaging would remain as Brooklyn until about the middle of 1969. 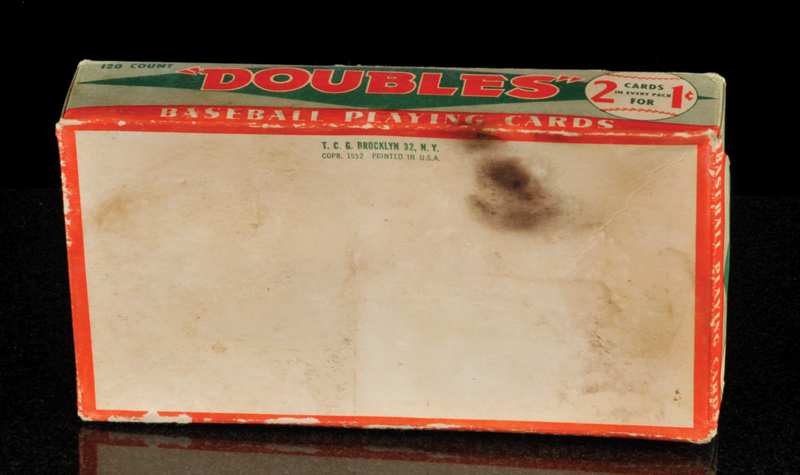 The Duryea move also brought about production codes,which helped the Topps brass back in Brooklyn keep track of each set or product being manufactured. The majority of these codes will have the last digit representing the year of production (it is a single digit, not a double so one ending in 7 would mean 1967 on a five cent pack). These were not applied to all materials originally but by 1968 virtually all packs and retail boxes, not to mention other packaging, had a code. Most times these were nine digits, with four dashes separating various groupings of numbers, all of which had meaning to Topps. 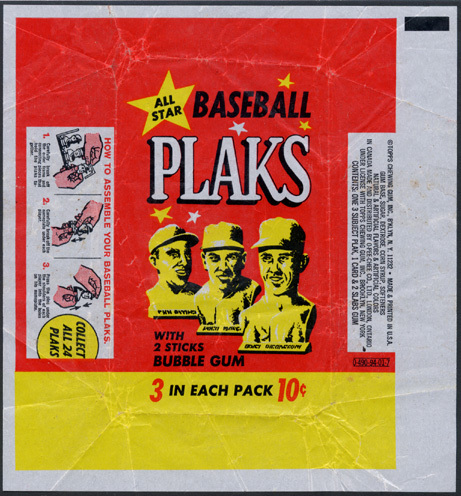 Even this scarce Baseball Plaks wrapper form 1967 (not 1968, check the last digit) has the code in the lower right corner which reads 0-490-94-01-7. Most card packaging from this time has a code starting with a zero while some non-confectionery products such as Flying Things or other more toy-like issues would use a different style of production code. It's hard to make out but the registered trademark sign is below and to the right of the Topps logo. 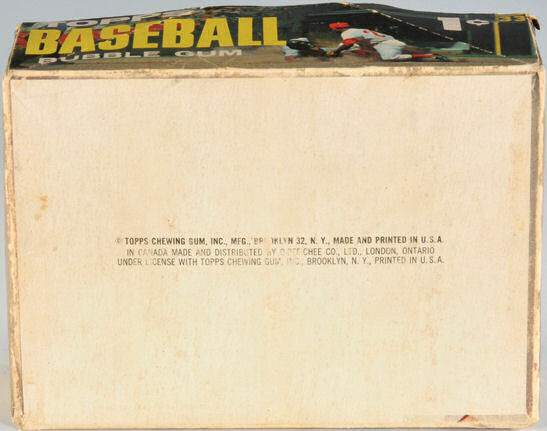 Topps filed for their new trademark on March 17, 1966 and it was "published for opposition" on March 7, 1967 with an official registration date of May 23, 1967. Topps probably banked on there being no opposition and started using it immediately on their best selling product. Some 1967 issues have the symbol and some don't so it was a transition year. 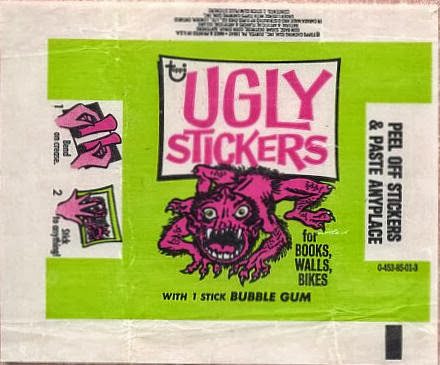 1981 Topps Baseball was the first packaging to use this new logo I believe but some products in '81 still had the curved one. But you could still get premiums from Brooklyn at this time; it seemed to depend upon the age of the premium. Older ones came out of Brooklyn while newer ones, such as the famous Exploding Battleship, came from Minnesota. Once Topps got production up and running in Duryea though and shed a lot of their Brooklyn warehouse space, St. Paul became the norm around 1967. By this time the premium fulfillment was likely exclusively contracted to third parties. Westbury would remain through the end of the decade and beyond. I'll stop here as post-1981 packaging is well-documented elsewhere and my focus also ends at the end of the 70's. As always with Topps, there are exceptions to the rule but what I have outlined above is a handy, quick guide to identifying issues where you can't fully inspect the packaging up close or only a part is visible. At some point I will delve into the intricacies of the Production Codes but that is a truly epic project. 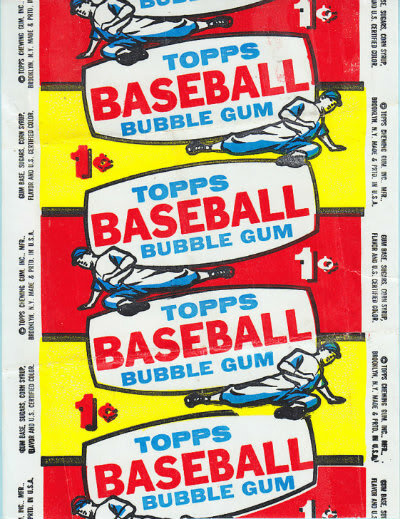 Meanwhile, know that you can use the code (geez, I sound like Dexter Morgan) for dating --as long as it's visible-- to easily decipher Topps dates in addition to the less obvious clues on the wrappers. What If I Want An Egg Cream? A couple of points to make. 1) Those cones are gonna fall and 2) Where's the napkins? Being the result of an idiosyncratic insert to a scarcely known issue (Mini Model Cars), there can't be too many completed puzzles out there so a hearty well done is in order Bill! Bill is nearing completion of the Racing Track cards that comprise the majority of the 33 inserts and you can bet we will feature the completed puzzle here once he hits the finish line. 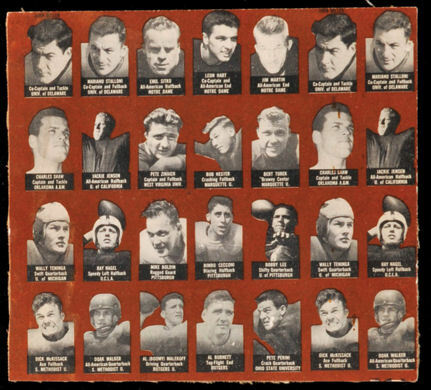 Well folks, thanks to the August Legendary Auctions catalog, there may be a way to pin down the 1949 Varsity Football sheet size. Now I think it's pretty likely the sheets for these show either 100 cards arrayed 10 x 10 of that arrangement is carried over onto a larger sheet. 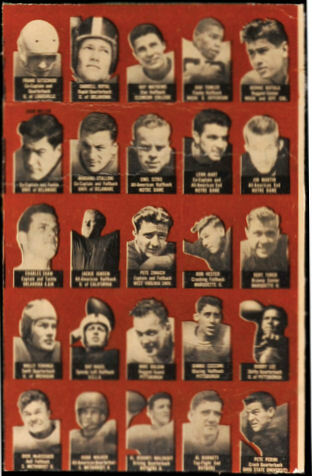 There is always the option a 7 x 18 array exists, a la 1948-49 Magic Photos but my operating theory on the latter is that they were printed at a different facility or on a different press than the Varsity Football and other similar cards in 1949 due to their chemical coating. Further reinforcing this theory is the 1955 Hocus Focus small issue, which clocks in at 126 cards. I don't believe they are a matched pair but they may both also hail from the top row-check out all the real estate above each side's first row above. Lots and lots of white off to the right. While License Plates and Flags Of All Nations clocked in at 100 subjects apiece I have never seen any uncut sheets or panels for those sets. I'll keep looking but I think the 10 x 10 print array for Varsity is right.